1. Heat oil in a pan, add corn and saute till corn is cooked and lightly charred. Season with salt & pepper. Let cool. 2. 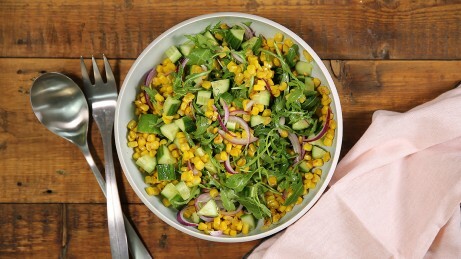 Place the corn kernels, cucumber, rocket and onion in a bowl and mix. 3. For the dressing, stir together olive oil, lemon juice, and vinegar. Season to taste, pour over salad and toss. 1 Heat oil in a pan, add corn and saute till corn is cooked and lightly charred. Season with salt & pepper. Let cool. 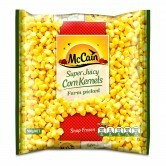 2 Place the corn kernels, cucumber, rocket and onion in a bowl and mix. 3 For the dressing, stir together olive oil, lemon juice, and vinegar. Season to taste, pour over salad and toss.